Yes, I know, said the night-watchman, thoughtfully, as he sat with a cold pipe in his mouth gazing across the river. I've 'eard it afore. People tell me they don't believe in ghosts and make a laugh of 'em, and all I say is: let them take on a night-watchman's job. Let 'em sit 'ere all alone of a night with the water lapping against the posts and the wind moaning in the corners; especially if a pal of theirs has slipped overboard, and there is little nasty bills stuck up just outside in the High Street offering a reward for the body. Twice men 'ave fallen overboard from this jetty, and I've 'ad to stand my watch here the same night, and not a farthing more for it. One of the worst and artfullest ghosts I ever 'ad anything to do with was Sam Bullet. 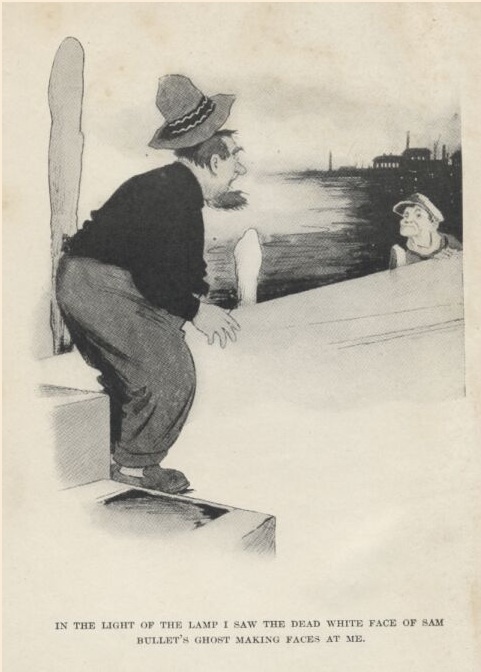 He was a waterman at the stairs near by 'ere; the sort o' man that 'ud get you to pay for drinks, and drink yours up by mistake arter he 'ad finished his own. The sort of man that 'ad always left his baccy-box at 'ome, but always 'ad a big pipe in 'is pocket. He fell overboard off of a lighter one evening, and all that his mates could save was 'is cap. It was on'y two nights afore that he 'ad knocked down an old man and bit a policeman's little finger to the bone, so that, as they pointed out to the widder, p'r'aps he was taken for a wise purpose. P'r'aps he was 'appier where he was than doing six months. "He was the sort o' chap that'll make himself 'appy anywhere," ses one of 'em, comforting-like. "Not without me," ses Mrs. Bullet, sobbing, and wiping her eyes on something she used for a pocket-hankercher. "He never could bear to be away from me. Was there no last words?" "On'y one," ses one o' the chaps, Joe Peel by name. "As 'e fell overboard," ses the other. Mrs. Bullet began to cry agin, and say wot a good 'usband he 'ad been. "Seventeen years come Michaelmas," she ses, "and never a cross word. Nothing was too good for me. Nothing. I 'ad only to ask to 'ave." "Well, he's gorn now," ses Joe, "and we thought we ought to come round and tell you." "So as you can tell the police," ses the other chap. That was 'ow I came to hear of it fust; a policeman told me that night as I stood outside the gate 'aving a quiet pipe. He wasn't shedding tears; his only idea was that Sam 'ad got off too easy. "Well, well," I ses, trying to pacify 'im, "he won't bite no more fingers; there's no policemen where he's gorn to." He went off grumbling and telling me to be careful, and I put my pipe out and walked up and down the wharf thinking. On'y a month afore I 'ad lent Sam fifteen shillings on a gold watch and chain wot he said an uncle 'ad left 'im. I wasn't wearing it because 'e said 'is uncle wouldn't like it, but I 'ad it in my pocket, and I took it out under one of the lamps and wondered wot I ought to do. My fust idea was to take it to Mrs. Bullet, and then, all of a sudden, the thought struck me: "Suppose he 'adn't come by it honest?" I walked up and down agin, thinking. If he 'adn't, and it was found out, it would blacken his good name and break 'is pore wife's 'art. That's the way I looked at it, and for his sake and 'er sake I determined to stick to it. I felt 'appier in my mind when I 'ad decided on that, and I went round to the Bear's Head and 'ad a pint. Arter that I 'ad another, and then I come back to the wharf and put the watch and chain on and went on with my work. Every time I looked down at the chain on my waistcoat it reminded me of Sam. I looked on to the river and thought of 'im going down on the ebb. Then I got a sort o' lonesome feeling standing on the end of the jetty all alone, and I went back to the Bear's Head and 'ad another pint. They didn't find the body, and I was a'most forgetting about Sam when one evening, as I was sitting on a box waiting to get my breath back to 'ave another go at sweeping, Joe Peel, Sam's mate, came on to the wharf to see me. He came in a mysterious sort o' way that I didn't like: looking be'ind 'im as though he was afraid of being follered, and speaking in a whisper as if 'e was afraid of being heard. He wasn't a man I liked, and I was glad that the watch and chain was stowed safe away in my trowsis-pocket. "I've 'ad a shock, watchman," he ses. "A shock wot's shook me all up," he ses, working up a shiver. "I've seen something wot I thought people never could see, and wot I never want to see agin. I've seen Sam!" I thought a bit afore I spoke. "Why, I thought he was drownded," I ses. "So 'e is," ses Joe. "When I say I've seen 'im I mean that I 'ave seen his ghost!" He began to shiver agin, all over. "Wot was it like?" I ses, very calm. "Like Sam," he ses, rather short. "When was it?" I ses. "Last night at a quarter to twelve," he ses. "It was standing at my front door waiting for me." "Worse than that," ses Joe, looking at me very 'ard. "It's wearing off now. The ghost gave me a message for you." I put my 'and in my trowsis-pocket and looked at 'im. Then I walked very slow, towards the gate. "It gave me a message for you," ses Joe, walking beside me. "'We was always pals, Joe,'" it ses, "'you and me, and I want you to pay up fifteen bob for me wot I borrowed off of Bill the watchman. I can't rest until it's paid,' it ses. So here's the fifteen bob, watchman." He put his 'and in 'is pocket and takes out fifteen bob and 'olds it out to me. "No, no," I ses. "I can't take your money, Joe Peel. It wouldn't be right. Pore Sam is welcome to the fifteen bob--I don't want it." "You must take it," ses Joe. "The ghost said if you didn't it would come to me agin and agin till you did, and I can't stand any more of it." "I can't 'elp your troubles," I ses. "You must," ses Joe. "'Give Bill the fifteen bob,' it ses, 'and he'll give you a gold watch and chain wot I gave 'im to mind till it was paid.'" I see his little game then. "Gold watch and chain," I ses, laughing. "You must ha' misunderstood it, Joe." "I understood it right enough," ses Joe, getting a bit closer to me as I stepped outside the gate. "Here's your fifteen bob; are you going to give me that watch and chain?" "Sartainly not," I ses. "I don't know wot you mean by a watch and chain. If I 'ad it and I gave it to anybody, I should give it to Sam's widder, not to you." "It's nothing to do with 'er," ses Joe, very quick. "Sam was most pertikler about that." "I expect you dreamt it all," I ses. "Where would pore Sam get a gold watch and chain from? And why should 'e go to you about it? Why didn't 'e come to me? If 'e thinks I 'ave got it let 'im come to me." "All right, I'll go to the police-station," ses Joe. "I'll come with you," I ses. "But 'ere's a policeman coming along. Let's go to 'im." I moved towards 'im, but Joe hung back, and, arter using one or two words that would ha' made any ghost ashamed to know 'im, he sheered off. I 'ad a word or two with the policeman about the weather, and then I went inside and locked the gate. My idea was that Sam 'ad told Joe about the watch and chain afore he fell overboard. Joe was a nasty customer, and I could see that I should 'ave to be a bit careful. Some men might ha' told the police about it--but I never cared much for them. They're like kids in a way, always asking questions--most of which you can't answer. It was a little bit creepy all alone on the wharf that night. I don't deny it. Twice I thought I 'eard something coming up on tip-toe behind me. The second time I was so nervous that I began to sing to keep my spirits up, and I went on singing till three of the hands of the Susan Emily, wot was lying alongside, came up from the fo'c'sle and offered to fight me. I was thankful when daylight came. Five nights arterwards I 'ad the shock of my life. It was the fust night for some time that there was no craft up. A dark night, and a nasty moaning sort of a wind. I 'ad just lighted the lamp at the corner of the warehouse, wot 'ad blown out, and was sitting down to rest afore putting the ladder away, when I 'appened to look along the jetty and saw a head coming up over the edge of it. In the light of the lamp I saw the dead white face of Sam Bullet's ghost making faces at me. I just caught my breath, sharp like, and then turned and ran for the gate like a race-horse. I 'ad left the key in the padlock, in case of anything happening, and I just gave it one turn, flung the wicket open and slammed it in the ghost's face, and tumbled out into the road. I ran slap into the arms of a young policeman wot was passing. Nasty, short-tempered chap he was, but I don't think I was more glad to see anybody in my life. I hugged 'im till 'e nearly lost 'is breath, and then he sat me down on the kerb-stone and asked me wot I meant by it. Wot with the excitement and the running I couldn't speak at fust, and when I did he said I was trying to deceive 'im. "There ain't no such thing as ghosts," he ses; "you've been drinking." "It came up out o' the river and run arter me like the wind," I ses. "Why didn't it catch you, then?" he ses, looking me up and down and all round about. "Talk sense." He went up to the gate and peeped in, and, arter watching a moment, stepped inside and walked down the wharf, with me follering. It was my dooty; besides, I didn't like being left all alone by myself. Twice we walked up and down and all over the wharf. He flashed his lantern into all the dark corners, into empty barrels and boxes, and then he turned and flashed it right into my face and shook his 'ead at me. "You've been having a bit of a lark with me," he ses, "and for two pins I'd take you. Mind, if you say a word about this to anybody, I will." He stalked off with his 'ead in the air, and left me all alone in charge of a wharf with a ghost on it. I stayed outside in the street, of course, but every now and then I fancied I heard something moving about the other side of the gate, and once it was so distinct that I run along to the Bear's Head and knocked 'em up and asked them for a little brandy, for illness. I didn't get it, of course; I didn't expect to; but I 'ad a little conversation with the landlord from 'is bedroom-winder that did me more good than the brandy would ha' done. Once or twice I thought he would 'ave fallen out, and many a man has 'ad his licence taken away for less than a quarter of wot 'e said to me that night. Arter he thought he 'ad finished and was going back to bed agin, I pointed' out to 'im that he 'adn't kissed me "good night," and if it 'adn't ha' been for 'is missis and two grown-up daughters and the potman I believe he'd ha' talked to me till daylight. 'Ow I got through the rest of the night I don't know. It seemed to be twenty nights instead of one, but the day came at last, and when the hands came on at six o'clock they found the gate open and me on dooty same as usual. I went out arter a bit, as far as the Clarendon Arms, for a breath of fresh air, and I 'ad just finished a pint and was wondering whether I ought to 'ave another, when Ted Dennis came in, and my mind was made up. He 'ad been in the Army all 'is life, and, so far, he 'ad never seen anything that 'ad frightened 'im. I've seen him myself take on men twice 'is size just for the love of the thing, and, arter knocking them silly, stand 'em a pint out of 'is own pocket. When I asked 'im whether he was afraid of ghosts he laughed so 'ard that the landlord came from the other end of the bar to see wot was the matter. I stood Ted a pint, and arter he 'ad finished it I told 'im just how things was. I didn't say anything about the watch and chain, because there was no need to, and when we came outside agin I 'ad engaged an assistant-watchman for ninepence a night. "All you've got to do," I ses, "is to keep me company. You needn't turn up till eight o'clock of a night, and you can leave 'arf an hour afore me in the morning." "Right-o!" ses Ted. "And if I see the ghost I'll make it wish it 'ad never been born." It was a load off my mind, and I went 'ome and ate a tea that made my missis talk about the work-'ouse, and orstritches in 'uman shape wot would eat a woman out of 'ouse and 'ome if she would let 'em. I got to the wharf just as it was striking six, and at a quarter to seven the wicket was pushed open gentle and the ugly 'ead of Mr. Joe Peel was shoved inside. "Hullo!" I ses. "Wot do you want?" "I want to save your life," he ses, in a solemn voice. "You was within a inch of death last night, watchman." "Oh!" I ses, careless-like. "'Ow do you know!" "The ghost o' Sam Bullet told me," ses Joe. "Arter it 'ad chased you up the wharf screaming for 'elp, it came round and told me all about it." "It seems fond of you," I ses. "I wonder why?" "It was in a terrible temper," ses Joe, "and its face was awful to look at. 'Tell the watchman,' it ses, 'that if he don't give you the watch and chain I shall appear to 'im agin and kill 'im.'" "All right," I ses, looking behind me to where three of the 'ands of the Daisy was sitting on the fo'c'sle smoking. "I've got plenty of company to-night." "Company won't save you," ses Joe. "For the last time, are you going to give me that watch and chain, or not? Here's your fifteen bob." "No," I ses; "even if I 'ad got it I shouldn't give it to you; and it's no use giving' it to the ghost, because, being made of air, he 'asn't got anywhere to put it." "Very good," ses Joe, giving me a black look. "I've done all I can to save you, but if you won't listen to sense, you won't. You'll see Sam Bullet agin, and you'll not on'y lose the watch and chain but your life as well." "All right," I ses, "and thank you kindly, but I've got an assistant, as it 'appens--a man wot wants to see a ghost." "An' assistant?" ses Joe, staring. "An old soldier," I ses. "A man wot likes trouble and danger. His idea is to shoot the ghost and see wot 'appens." "Shoot!" ses Joe. "Shoot a pore 'armless ghost. Does he want to be 'ung? Ain't it enough for a pore man to be drownded, but wot you must try and shoot 'im arterwards? Why, you ought to be ashamed o' yourself. Where's your 'art?" "It won't be shot if it don't come on my wharf," I ses. "Though I don't mind if it does when I've got somebody with me. I ain't afraid of anything living, and I don't mind ghosts when there's two of us. Besides which, the noise of the pistol 'll wake up 'arf the river." "You take care you don't get woke up," ses Joe, 'ardly able to speak for temper. He went off stamping, and grinding 'is teeth, and at eight o'clock to the minute, Ted Dennis turned up with 'is pistol and helped me take care of the wharf. Happy as a skylark 'e was, and to see him 'iding behind a barrel with his pistol ready, waiting for the ghost, a'most made me forget the expense of it all. It never came near us that night, and Ted was a bit disappointed next morning as he took 'is ninepence and went off. Next night was the same, and the next, and then Ted gave up hiding on the wharf for it, and sat and snoozed in the office instead. A week went by, and then another, and still there was no sign of Sam Bullet's ghost, or Joe Peel, and every morning I 'ad to try and work up a smile as I shelled out ninepence for Ted. It nearly ruined me, and, worse than that, I couldn't explain why I was short to the missis. Fust of all she asked me wot I was spending it on, then she asked me who I was spending it on. It nearly broke up my 'ome--she did smash one kitchen- chair and a vase off the parlour mantelpiece--but I wouldn't tell 'er, and then, led away by some men on strike at Smith's wharf, Ted went on strike for a bob a night. That was arter he 'ad been with me for three weeks, and when Saturday came, of course I was more short than ever, and people came and stood at their doors all the way down our street to listen to the missis taking my character away. I stood it as long as I could, and then, when 'er back was turned for 'arf a moment, I slipped out. While she'd been talking I'd been thinking, and it came to me clear as daylight that there was no need for me to sacrifice myself any longer looking arter a dead man's watch and chain. I didn't know exactly where Joe Peel lived, but I knew the part, and arter peeping into seven public-'ouses I see the man I wanted sitting by 'imself in a little bar. I walked in quiet-like, and sat down opposite 'im. "'Ave one with me?" I ses. He grunted agin, but not quite so fierce, and I fetched the two pints from the counter and took a seat alongside of 'im. "I've been looking for you," I ses. "Oh!" he ses, looking me up and down and all over. "Well, you've found me now." "I want to talk to you about the ghost of pore Sam Bullet," I ses. Joe Peel put 'is mug down sudden and looked at me fierce. "Look 'ere! Don't you come and try to be funny with me," he ses. "'Cos I won't 'ave it." "I don't want to be funny," I ses. "Wot I want to know is, are you in the same mind about that watch and chain as you was the other day?" He didn't seem to be able to speak at fust, but arter a time 'e gives a gasp. "Woes the game?" he ses. "Wot I want to know is, if I give you that watch and chain for fifteen bob, will that keep the ghost from 'anging round my wharf agin?" I ses. "Why, o' course," he ses, staring; "but you ain't been seeing it agin, 'ave you?" "I've not, and I don't want to," I ses. "If it wants you to 'ave the watch and chain, give me the fifteen bob, and it's yours." He looked at me for a moment as if he couldn't believe 'is eyesight, and then 'e puts his 'and into 'is trowsis-pocket and pulls out one shilling and fourpence, 'arf a clay-pipe, and a bit o' lead-pencil. "That's all I've got with me," he ses. "I'll owe you the rest. You ought to ha' took the fifteen bob when I 'ad it." There was no 'elp for it, and arter making 'im swear to give me the rest o' the money when 'e got it, and that I shouldn't see the ghost agin, I 'anded the things over to 'im and came away. He came to the door to see me off, and if ever a man looked puzzled, 'e did. Pleased at the same time. It was a load off of my mind. My con-science told me I'd done right, and arter sending a little boy with a note to Ted Dennis to tell 'im not to come any more, I felt 'appier than I 'ad done for a long time. When I got to the wharf that evening it seemed like a diff'rent place, and I was whistling and smiling over my work quite in my old way, when the young policeman passed. "Hullo !" he ses. "'Ave you seen the ghost agin?" "I 'ave not," I ses, drawing myself up. "'Ave you?" "Missed it?" I ses, staring at 'im. "Yes," he ses, nodding. "The day arter you came out screaming, and cuddling me like a frightened baby, it shipped as A.B. on the barque Ocean King, for Valparaiso. We missed it by a few hours. Next time you see a ghost, knock it down fust and go and cuddle the police arterwards." Add Sam's Ghost to your own personal library.